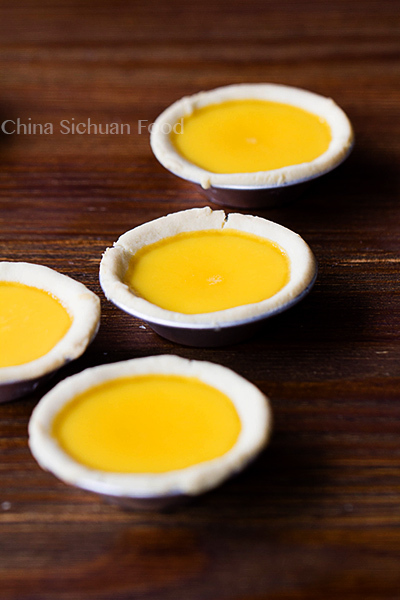 Detailed Hong Kong style egg tart recipe (港式蛋挞) with an easy shell and creamy filling. 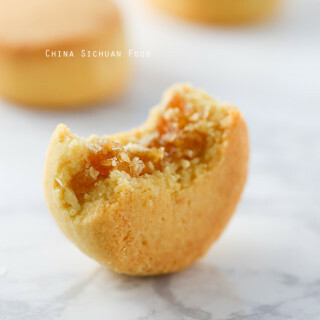 One year after moving to Guangdong province, I began to love Cantonese cuisine especially dim sum dishes and Hong Kong style cookie and desserts. 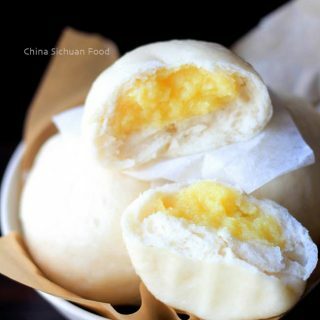 There are many small stores providing various cookies, egg tarts and soft Asian buns just over the street corner. The smell was so appealing to me so I indulged a lot. 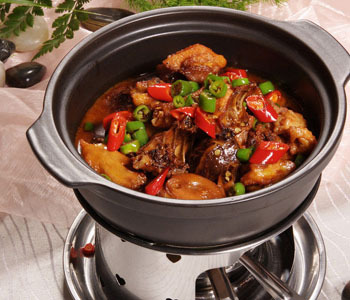 Then after another year, I began to look inside of Cantonese cuisine, trying various dishes at home and understanding the basic principles of making Cantonese dishes. 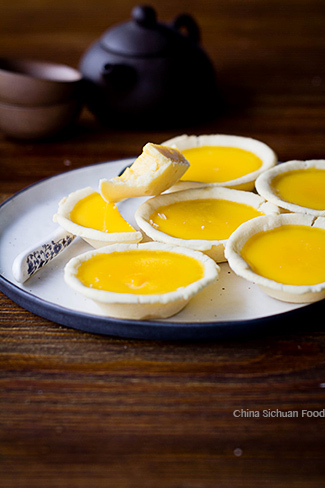 From that time on, I make my own egg tart, custard buns, char siu buns and so many other dim sum dishes at home. 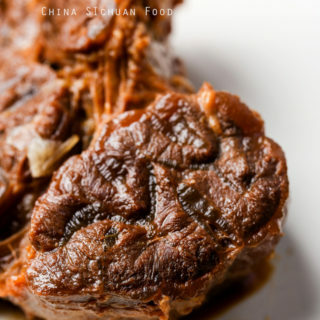 Honestly, Cantonese dishes are very different from my familiar Sichuan cuisine, usually require higher kitchen skills and always respect the nature of the ingredients. That’s the reason why I am deeply attracted. I would highly suggest making the custard filling firstly, as the longer the filling rests, the better flavor you will get. There are two famous types of egg tart here in my country—one is Hong Kong style and the other one is Macao version also known as Portuguese Egg Tart. 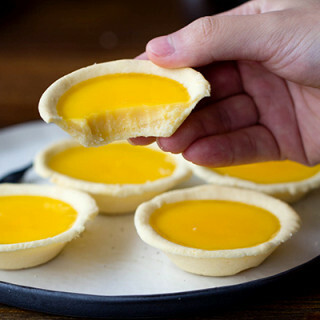 As Hong Kong style egg tart, there are two kinds of tart shells-one is puffy pastry similar to shell of Portuguese egg tart and the other one is short crust pastry, taste like a butter cookie. Elaine is introducing the later one—short crust pastry, as it is more practicable at home. There are two ways for assembling the shells to the moulds. One is pressing with fingers directly and the other is rolling out with a pin and cut the wrapper with a mould. Personally, I prefer the first method because it is much quicker and there is not need to worry about breaking the shells. 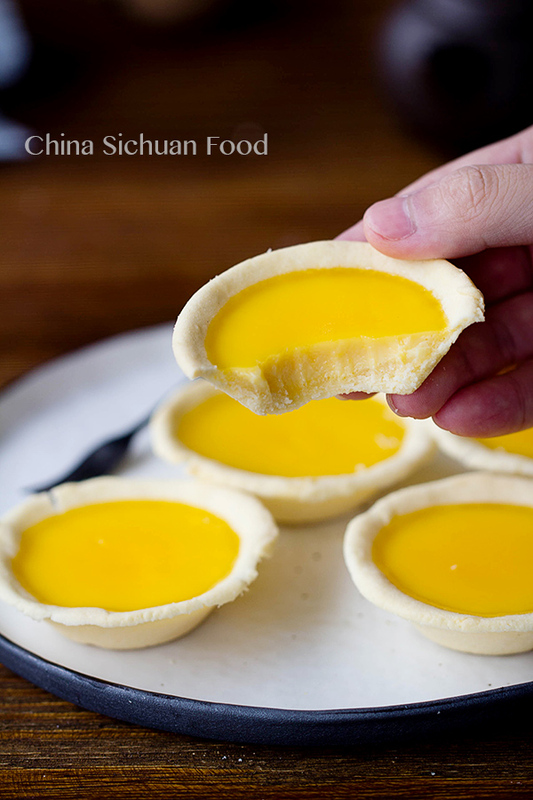 If you use the first method too, please try to make the shell uniform in thickness and avoid thick bottoms otherwise, egg tart shells might be broken when moving from the moulds. For making 8 egg tarts with regular egg tart; I do not use vanilla extract in this recipe but you can definitely add some if your prefer. I highly recommend measuring all the ingredients for the best result. I measured the ingredients and references are given in the following recipe. Video is here for more details. And do not forget to subscribe my youtube Channel. 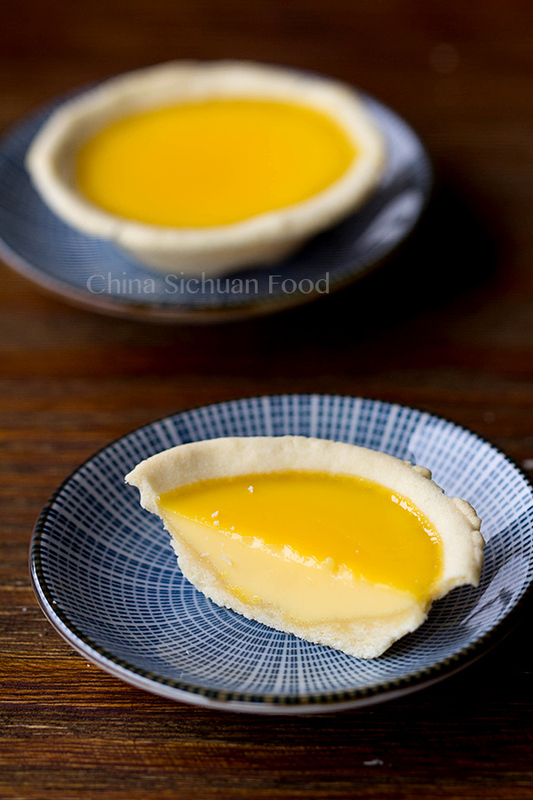 Famous Hong Kong style egg tart recipe with short crust pastry shell and a super smooth custard filling. Whisk eggs and then take around 1 tablespoon out for the pastry dough. Stir in sugar water and also evaporated milk(vanilla extract here too). Give a big stir and combine everything well. Take the dough out and divide into 8 equal portions. Make on portion into a round ball and slightly press down. And I would strongly suggest brushing some melt butter on the surface of the moulds so we can move them out easily. Press the shell into the moulds with your fingers. Try to make the wrapper uniform in thickness and avoid a thick bottom. Repeat to finish all. Pre-heat the over to 200 degree C (390 degree F). The Nutrition Facts is based on each single egg tart. Thanks Kim. You really need to try this. 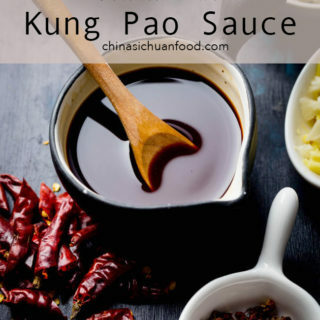 It is simple with really excellent flavor. When you are baking the egg tarts when do you lower the gas mark on how many degrees feel a bit confused please thanks? You can low the temperature for around 10 degree around 13 minutes. This is just to avoid the tarts rising up too high and collapse after cooling down. This recipes looks wonderful, and something that can easily be made by novice bakers. But I can’t seem to find any of those tart shell tins (metal or aluminum). That size doesn’t seem to be available where I live. Where did you buy yours from ? I found those tools in a bakery tool store. But I am based in China where those shell tins are quite popular. 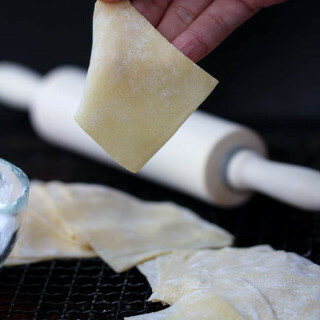 If you cannot find some,you can make some one time shell with silver paper. Did it today.. It was soo tasty.. I didn’t use the dough you were recommend but instead shortcrust pastry and it turns out really well.. 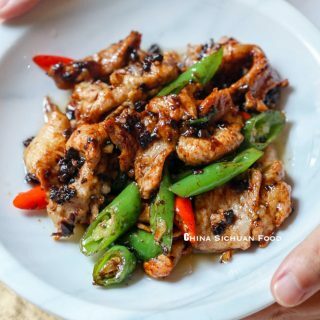 Thanks for sharing this recipe.. I have been craving for this.. Thanks so much for the feedback. I am quite glad that you love this as it has been one of my comforting dessert now. I just tried this recipe and it came out nice. It tastes delicious and my sisters loved it too. I’m so excited to let my mom taste it. Thanks for your kind feedback. 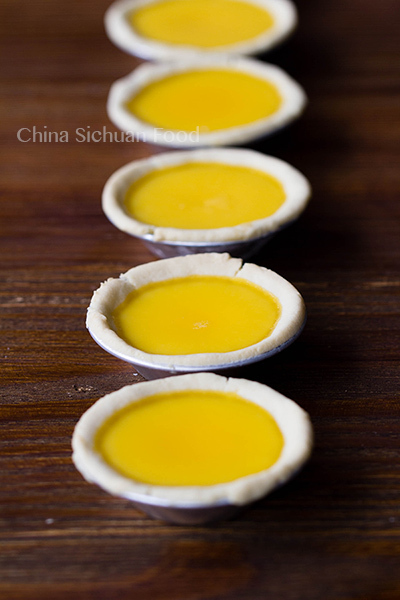 This easier version of HK egg tart is one my top 10 list for social gathering. Hope your mom will like it too. Happy cooking ahead. What is the name of the first reggea song, please? Btw the cookies looks wonderful! Thank you for the kind words. The first song is dub spirit from Youtube Audio Library. Egg tarts are delicious. Thank you for this great recipe, Elaine. Hi! 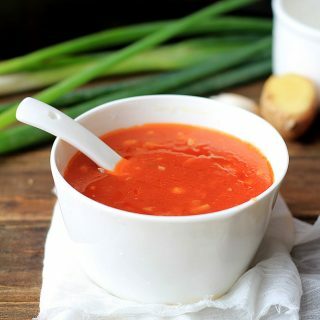 I’ve tried this recipe several times, and it tastes great! However, the bottom crust always caves upward when the tarts come out of the oven. Is it because I use cupcake pans? I love the taste, I just hope I can make them look pretty, too! If this happens several times, my suggestion is to slightly lower the baking temperature in the last 5 minutes. Can you send me a photo via Facebook or instagram with tag #ElaineCSF? Hi, do you have a nutrition grid? Thanks for sharing this recipe. I love the egg tarts but didn’t know how to make it until now. Will all purpose flour work as well? All purpose flour may work, but cake flour can make the shell as fluffy as possible. Love Hong Kong egg tart but haven’t challenged it at home. Thanks for sharing such a detailed tutorial Elaine! hi can I replace evaporated milk with fresh milk? if can, the other ingredients amount will still be the same? thanks so much. 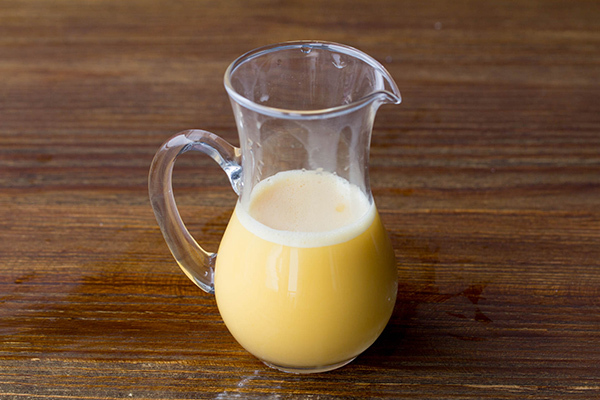 Evaporated milk contains less water than fresh milk and thus has a stronger taste. Can you get condensed milk? You can use the same amount of condensed milk and reduce 1 tablespoon of sugar. 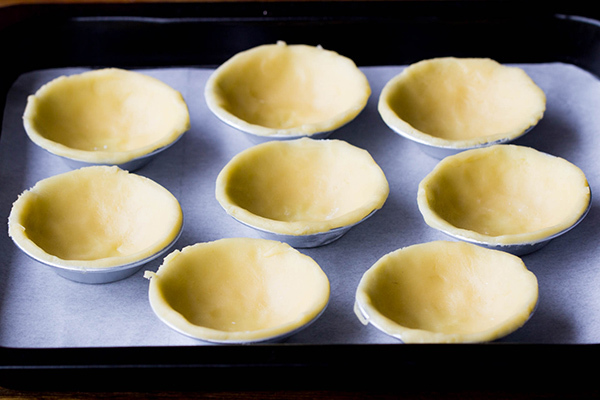 Yes, you can use pre-baked tart shell. But I cannot give you an exact answer about the baking temperature and time because I never used pre-baked tart shell. 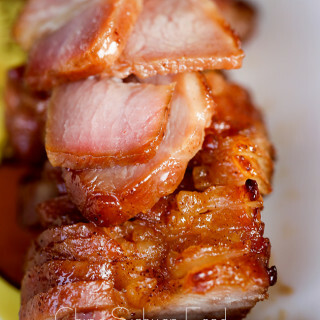 Tx for sharing this recipe,it is easy and delicious too. My kids and husband love it. I just tried it today and used all purpose flour,turned out good. The only problem I had was that my crust was too brown at the edge. I think 390F is a little bit too high,I baked mine for 13 mins with 390F and lower it to 350F for 2mins. Will try 375F and lower it to 350F next time. Easy to follow recipe and so yummy. Thanks Elaine!!!!! Thanks Wiwit for the wonderful feedback. I am so glad to know your family love this dessert too. It has been my daughter’s favorite afternoon snack. Hi, can I use a pre-made pie crust since I can’t find those tart molds? 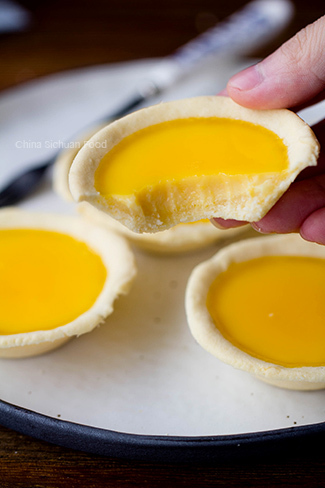 Sure, we use pre-made crust for homestyle egg tarts in most cases for convenience. I tried it! Really tasty!!!! Thank u very much for the recipe!!! You are the most welcome, Stephanie. 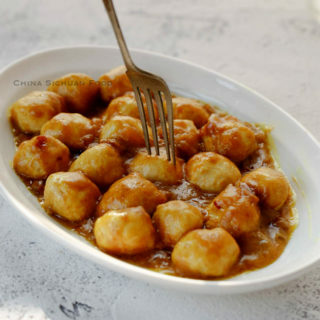 It is one of our favorite dessert too and quite easy to prepare. Happy cooking!